"World’s best, the new reference point to beat." 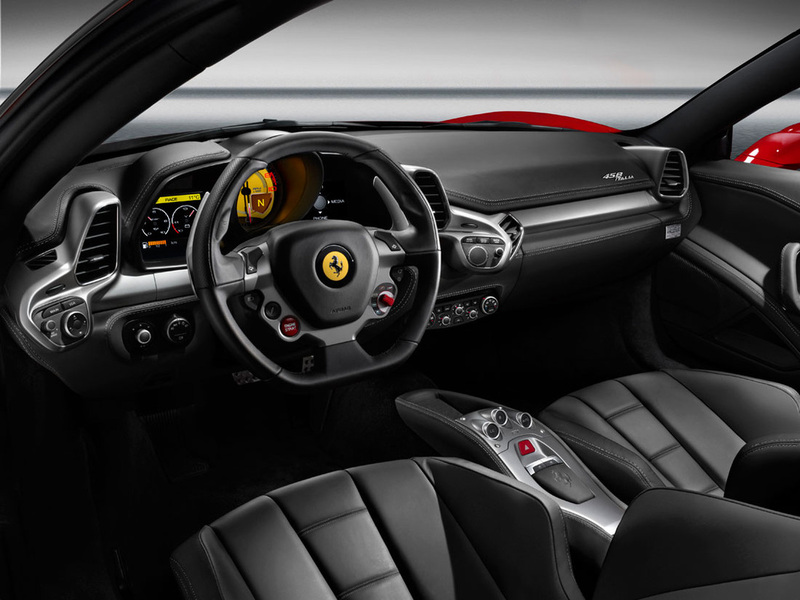 This is what Ferrari consider "entry level"
It's just behind that interior that the heart of the 458 lives, in the form of the 4.5-liter V-8 engine. 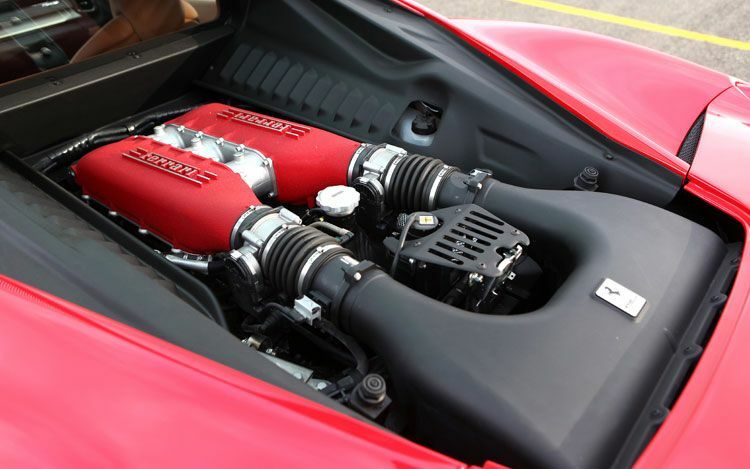 Rated at a stout 562 horsepower at the 9,000 rpm redline, and 400 pound-feet of torque, 80 percent of which is available from 3,250 rpm, the 458 Italia's V-8 is, in a word, magnificent. It's not the most powerful in the supercar world, but it's one of the most sonorous, and located right behind the passengers with only a thin divider between, it transforms from mellow and quiet to raucous and race-inspired with just a short sweep of the throttle pedal. As the sound awakens, so does the speed, vaulting the 458 Italia forth in frenetic style, hitting 60 mph in under 3.4 seconds and carrying on to a top speed of 202 mph (or 198 mph for the Spider). Both the Spider and the standard 458 Italia use the same Getrag seven-speed dual-clutch gearbox, inspired by Ferrari's F1 race cars. Gas mileage barely tips the 12 mpg city and 18 mpg highway mark. 'Car of the Year' because it’s our winner because the scope of its abilities is absolutely breathtaking. … the 458 Italia isn’t just a worthy winner, it’s off the scale. "The Ferrari 458 Italia is described as a real technological icon with innovations from F1 and an unbeatable performance"
"Ferrari put its soul in this car, a synthesis of the highest form of technology"
"The 458 Italia is an awesome example of car-making art at its highest level and is probably the finest sports car you can buy." "The steering is incredibly sharp, but there's none of the wound-up feel of previous models. The 458 goes sideways but it doesn't come off the slide with a bang, more a polite murmur." "The Italia feels like a feisty thoroughbred stallion you are convinced is going to run away with you, but very quickly you realise that it can cope with anything the road can throw at you, thanks to an impressive array of gadgetry. It grips the road like a leech and seems to get more grip the harder you go, almost challenging you to go faster." "It’s our “golden wheel”. 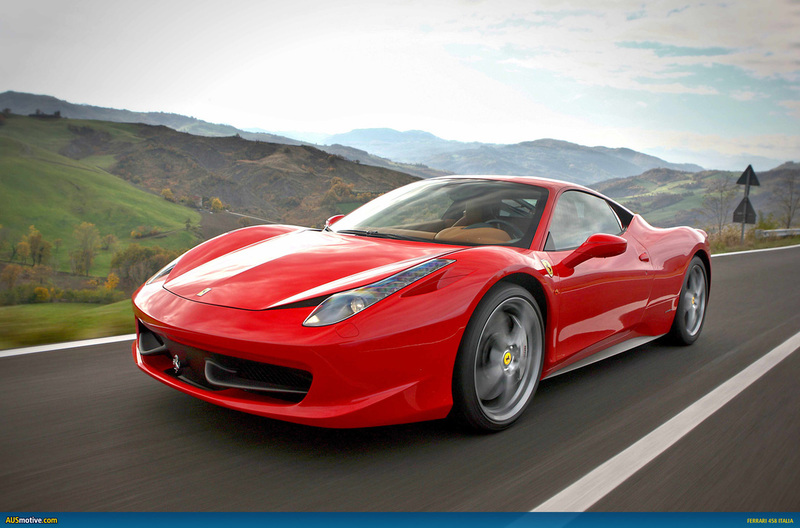 If we had to pick our top 10 in terms of driving pleasure the new Ferrari 458 Italia would happily take the top spot." 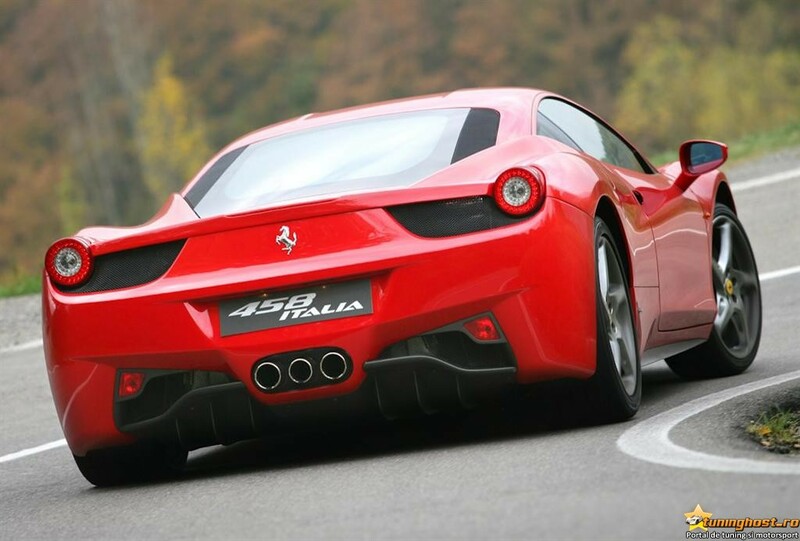 "The 458 Italia’s breathtaking acceleration is a moment of happiness even for the ears and the steering’s sweetness allows you to take corner after corner without getting tired." "Turn the key, prepare for hyperspace. Only the Italians could invent such an expensive mistress, but then only the Italians could flatter you in the way the 458 does. The low-slung seats – you can visit the factory and select the colour of the stitching and seatbelts to match your chosen paintwork – elevate you above everything else on the road." "This 458 Italia has totally conquered us. This new two-seater mid-engine model from Ferrari gave us a lecture in dynamics with its ability of drift control." 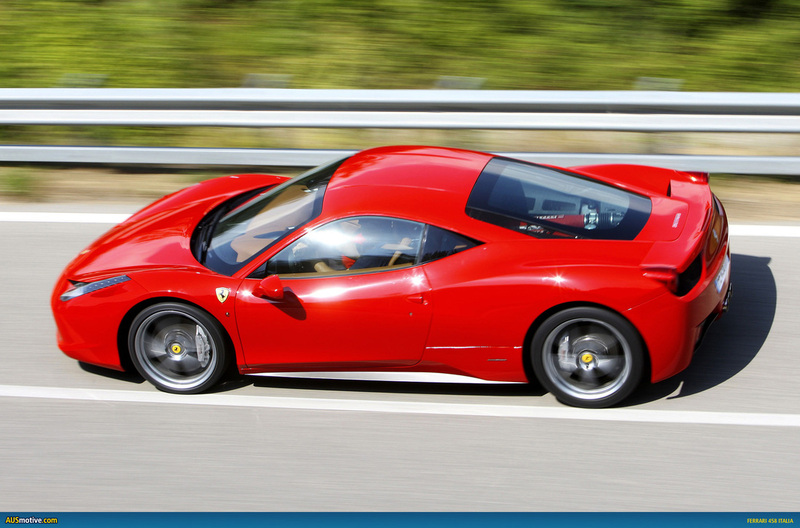 "I drove the 458 solidly for five hours and came away hugely impressed. It responded to my two big doubts (the gearbox and steering) in the best possible way: by putting a smile on my face." "The latest all-new Ferrari is the most useable yet - a racer for the road but with more than a nod in the direction of GT talents as well. Perhaps the greatest compliment we can pay the 458 is that it no longer feels like it needs a Challenge Stradale or Scuderia version. The 458 does it all. And does it bloody well." "Born out of competence, but foremost out of the best Ferrari engineers’ passion. A car introducing unseen technical content, but also a supercar completely involving the driver. Easy to exploit and exhilarating on the road and on the track." "Ferrari without limits. Smooth on the road, angry on the track." "The incredible technological evolution of the supercar. The 458 Italia is the result of a new way of interpreting sportiness made in Maranello, creating a formula of sustainable development of the traditional Ferrari values, valid today and even more so in the future." "The car amazes with its stability to instill confidence ... It's also one of the prettiest and best engineered supercars of this century"
"The steering is exceedingly well tuned. Perfectly weighted. Perfectly precise. Perfectly communicative. Perfect. Divinely perfect." "Just brilliant to drive, it worths its price"
"Enthralling driving on the road, extreme handling and a gratifying sensation of being one with the car. In other words: having complete control." 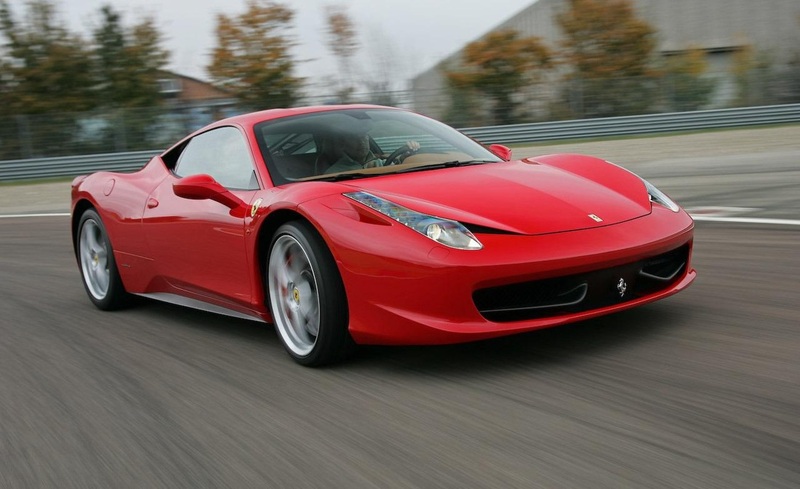 Jeremy Clarkson's review of the Ferrari 458 Italia was epic and hilarious as expected. 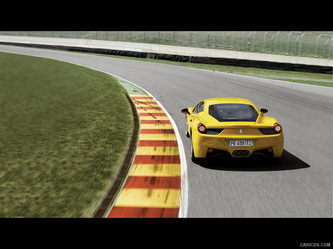 We waited with baited breath and he didn't let us down with his video of the 458. 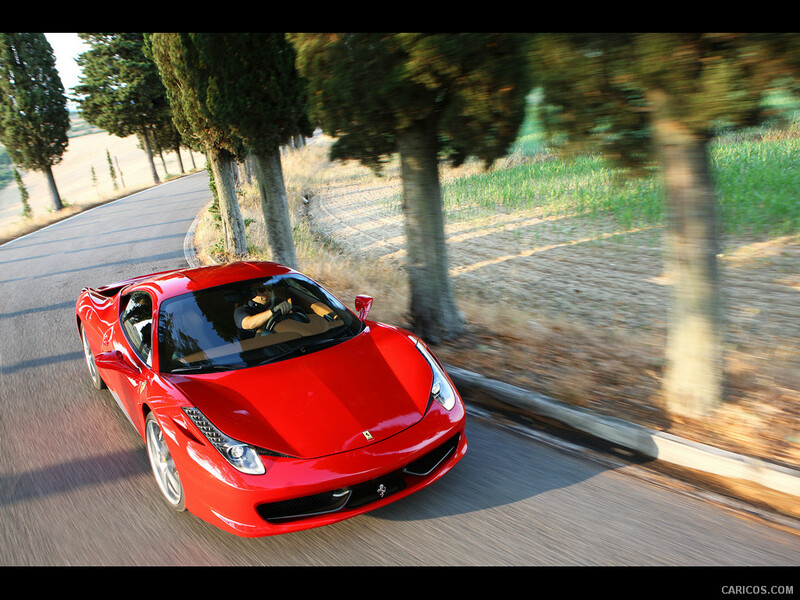 Jeremy Clarkson loves the 458 Italia and thrashes it for our video-viewing pleasure. The chassis of the 458 Italia is constructed of aluminum and suspended by control arms up front and multilinks in the rear. 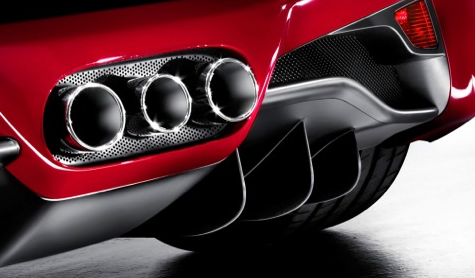 Ferrari promises an even more direct steering ratio, which should help maintain the fantastic turn-in we know from the F430 despite nearly two extra inches of wheelbase and 0.6 inch of additional length (the Italia’s wheels sit 104.3 inches apart). The 458 Italia is 178.2 inches long, 76.3 inches wide, and 47.8 inches tall, which represent increases of 0.6 inch, 0.6 inch, and nothing, respectively. The 458 will boast essentially the same weight distribution as the F430, with 42 percent of its heft over the front axle and 58 percent over the rear. It's fast. With a 570bhp 4.5-litre V8, of course it's fast, and the seven-speed twin-clutch semi-auto gearbox is more than capable of keeping up with the engine. However, it's the breadth of ability that really gets you. With the gearbox in full automatic mode, it will dawdle through town at 35mph in seventh gear. Seventh! Astonishingly flexible. Its 0-60mph time starts with a three, its top speed starts with a two and, on the way, it passes 100mph in around seven seconds, eases to a standing quarter mile in less than 12sec. 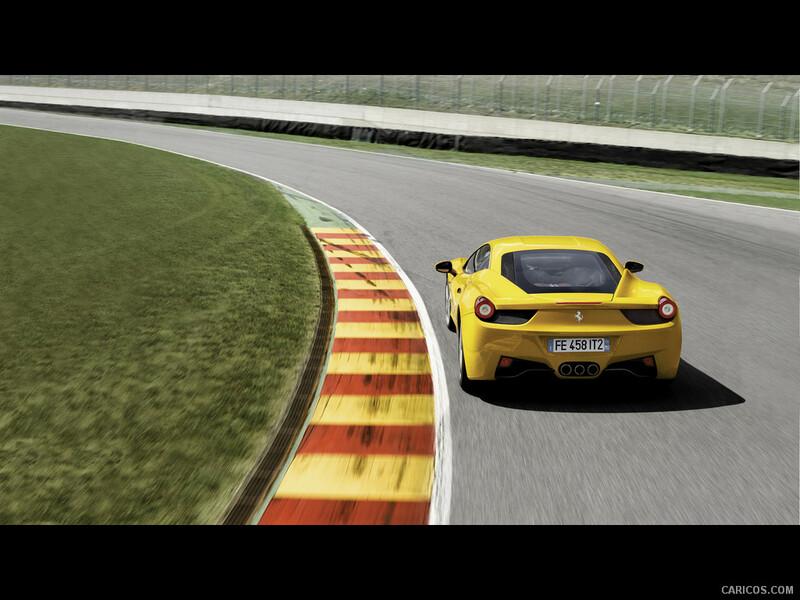 More impressive than the numbers themselves, though, is the way with which the 458 goes about setting them. Not too many years ago, extracting 562bhp from a naturally aspirated 4.5-litre engine – some 125bhp per litre – would have produced an undriveable, snarling fire-breather of an engine. Not too many years before that, it would not have happened in a road car at all. There is no hang, no lag, no waiting when you floor the 458 Italia pedal, it just builds it's revs at an astonishing rate. You ask of the throttle and the engine delivers in an utterly predictable, linear fashion. The 458’s power is directed to its wheels via a dual-clutch transmission that is utterly superb. It is efficient and fun, even in auto-mode where it reads you mind. The 458, like all current Ferraris, comes as standard with carbon-ceramic brakes capable of stopping it repeatedly, from high speed, in no time at all. The sound of the mid-ships engine is, simply, glorious. Only a thin divider separates the engine from the passenger compartment, and that means there's a symphony of mechanical excellence each and every time you fire it up and plant your foot. The presence of the engine transforms the car from a fairly mellow cruiser to a race-bred thrill machine with just a quick stab of the gas. It's not all about the auditory experience, however. The 458 Italia and 458 Spider also deliver impressive speed and remarkable driver feedback. The coupe hits 60 mph from a stop in just 3.4 seconds, and carries on to a top speed of 202 mph. The Spider's slightly less-slick aerodynamics cap it at 198 mph. Both cars use the same Getrag seven-speed dual-clutch gearbox, and both get gas mileage around the 12-mpg mark in the city and 18 mpg on the highway. 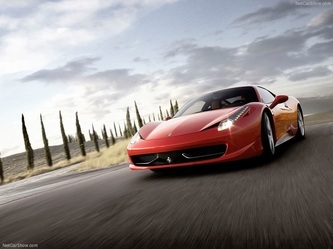 The handling, however, is where the Ferrari 458 truly shines. Balance and grip are both evident in large quantities, imbuing a stability not often found in high-horsepower, mid-engine cars. The steering feel is among the very best we've ever experienced, with perfect weight and exquisitely detailed feedback about the road surface and the tires' comfort zones.